Yes, it’s the same little girl whose portrait captured so many hearts, and she is just as crazy about birds as when we she found that sparrow in the tree last year, but now, at three years of age, she is flying with the birds! 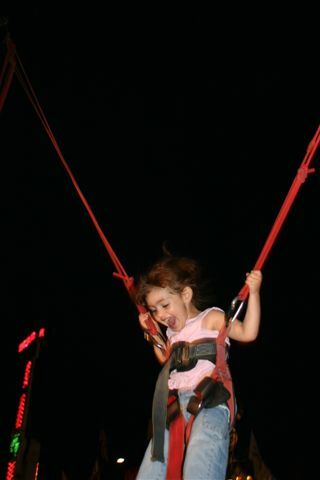 She went bungee jumping at the Kane County (IL) Fair. 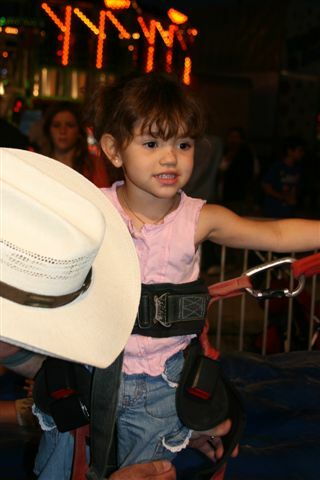 Here, she looks forward to the adventure as Papi helps strap her into the harness. 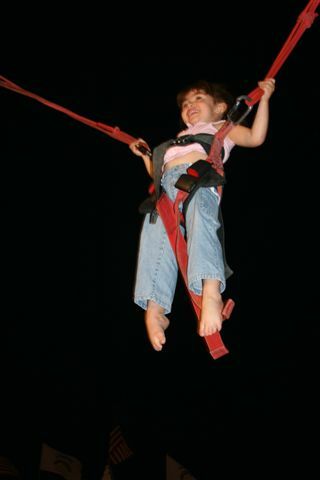 Am I sure I am going to like this? 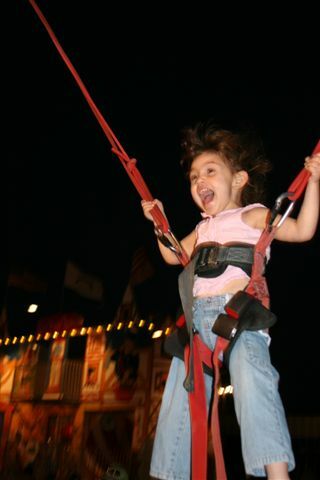 OK– Let’s do it again! Seeing these pictures, Grandma and Grandpa are ready for their grandbaby fix, so off we go! Don’t even need a hurricane to chase us out of South Florida. 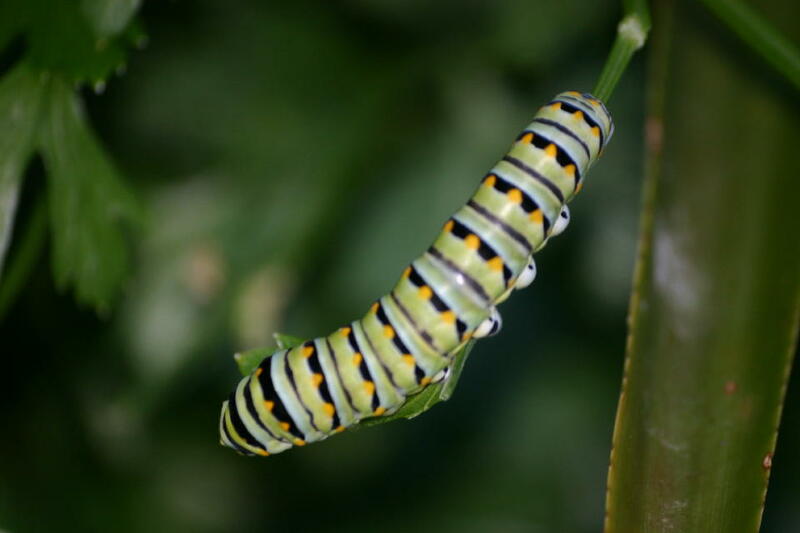 We collected four more parsley caterpillars and hope that the children will get to see them turn into butterflies (if they make it through Homeland Security at the airport!). 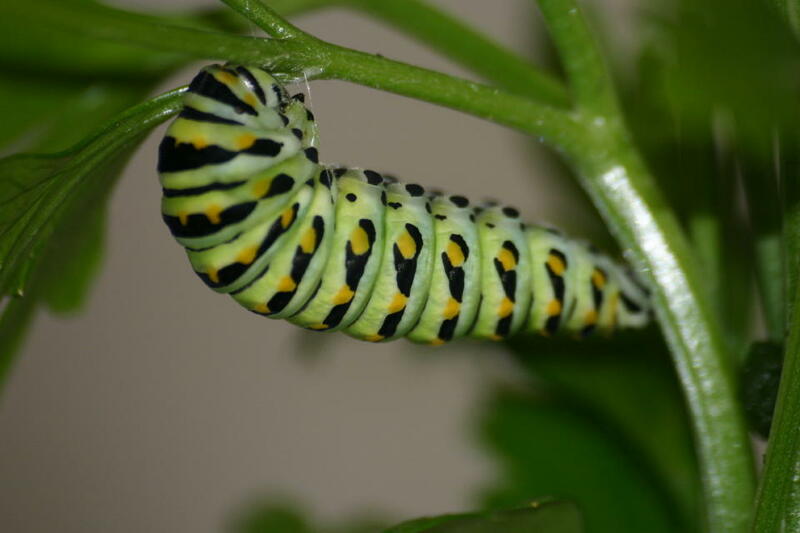 Earlier this month, I decided to leave my parsley plant to the mercy of the Black Swallowtail caterpillars that were devouring it at an alarming rate. 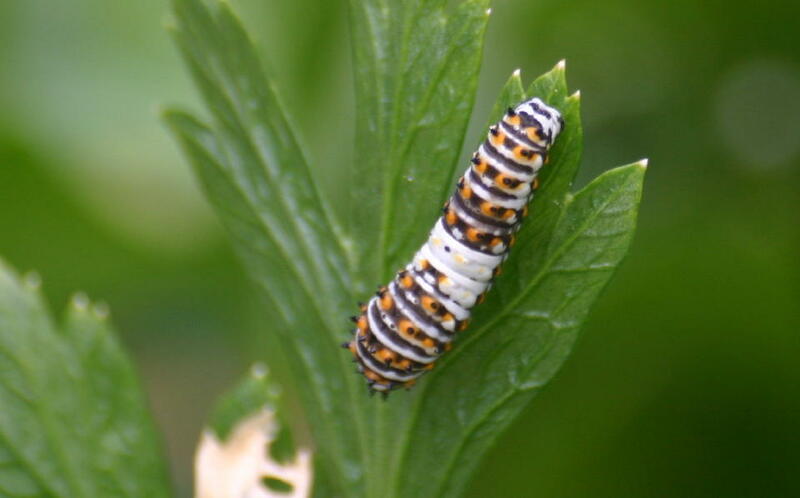 The early larval stages (termed instars) molt several times, changing their appearance more or less dramatically between molts. 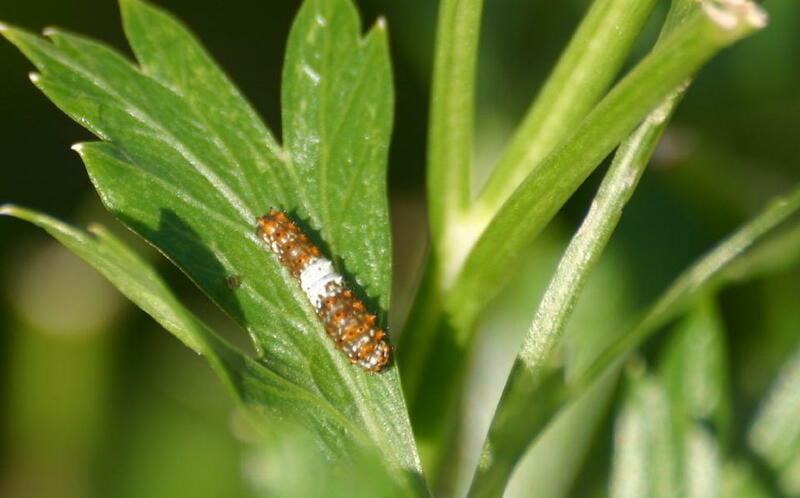 The earliest instars are dark and have a white saddle, making them look very much like bird droppings. After another molt, about two days later, this caterpillar retained some of the white saddle.It measured about 2 cm. 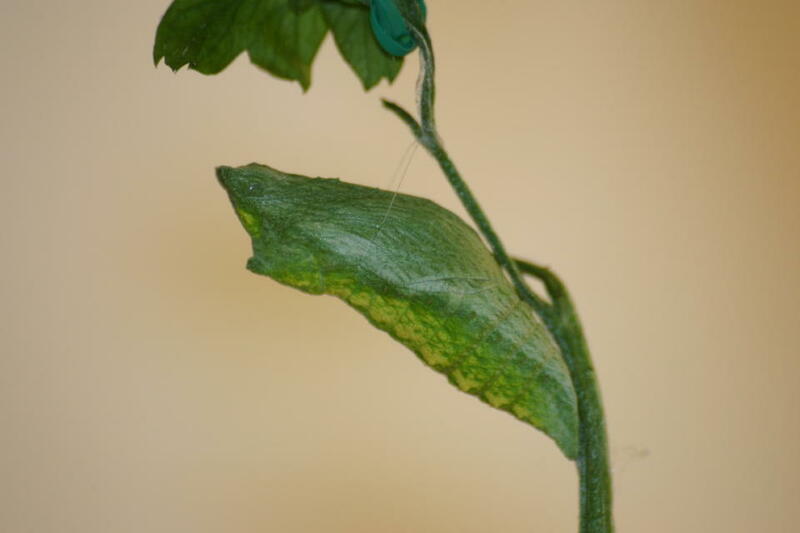 When I first discovered the infestation, there were several caterpillars in more advanced stages. I decided to watch them to see if I could find a chrysalis. One by one, they disappeared , and hard as I tried, I could not find any among the parsley or nearby plants. 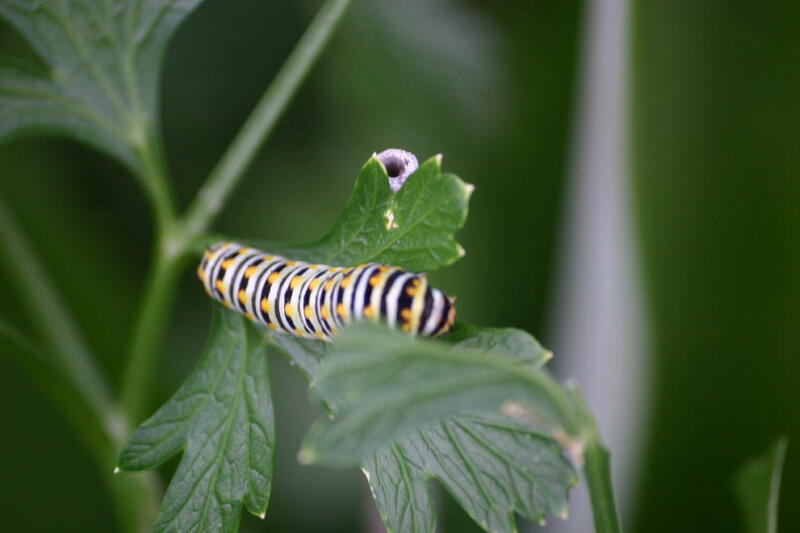 When there were only two left, I collected this one and brought him into the kitchen on a generous sprig of parsley, hoping to watch it pupate. 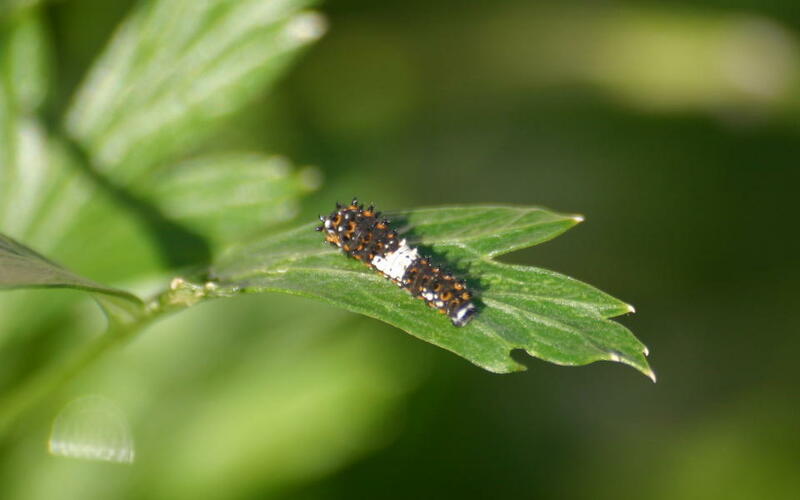 The caterpillar was truly an eating machine, devouring entire parsley leaves in a couple of minutes and depositing large amounts of feces. Its head area began to swell noticeably. Then, on the third day of captivity, it stopped eating and assumed this crooked position, remaining immobile for the entire day. 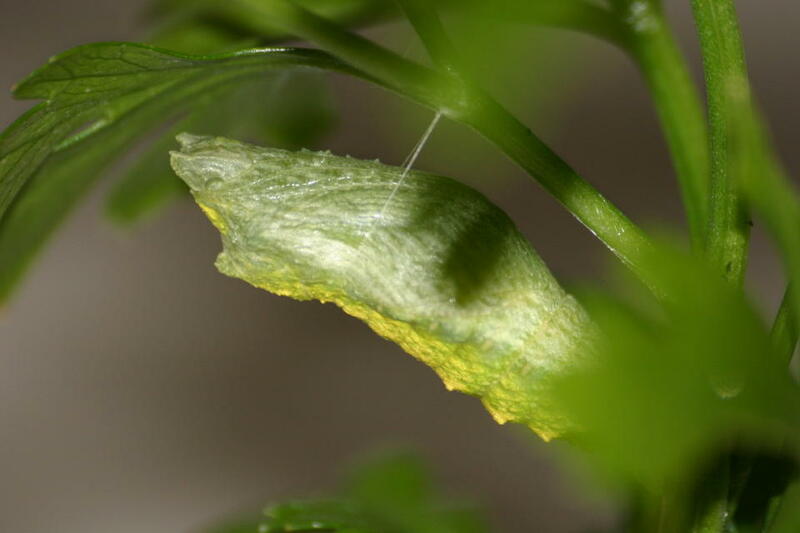 Note the strand of silk that it had spun as a kind of sling that will help support it as a chrysalis. 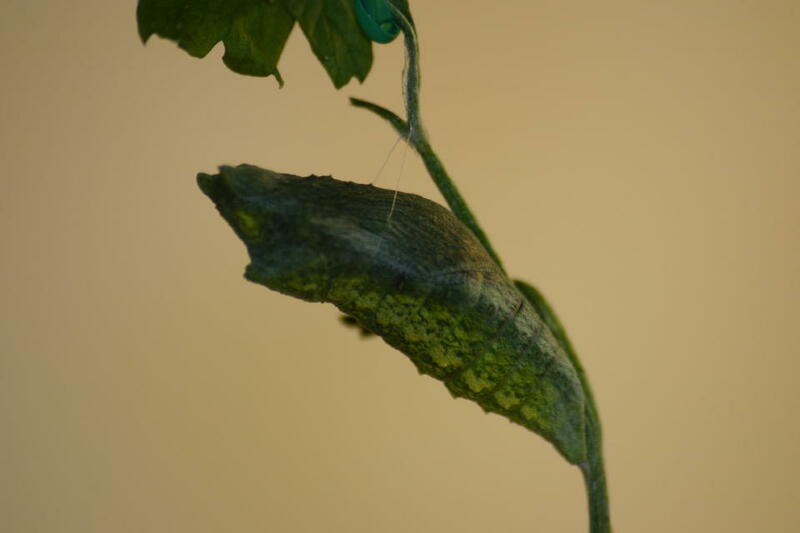 I hoped to see it actually morph into the chrysalis, but it looked about the same when I went to bed at 11 PM. 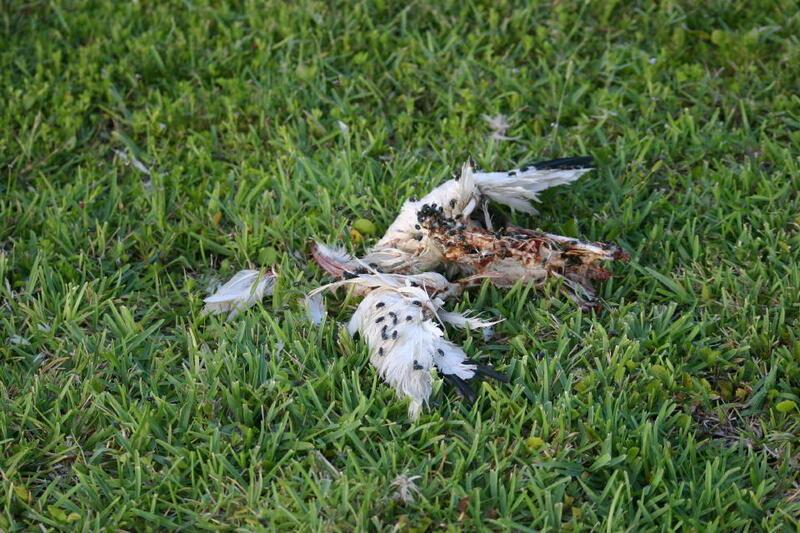 The next morning, I first thought it had escaped, as it was nowhere to be seen. 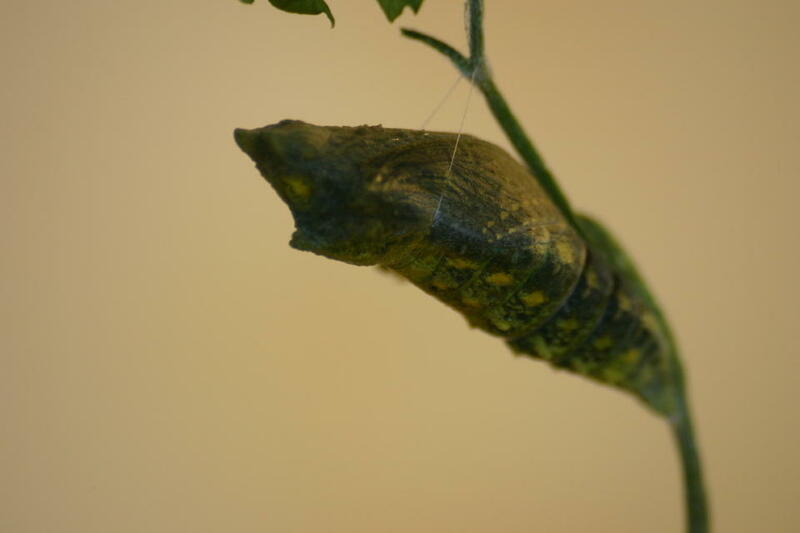 I was amazed how the new chrysalis blended into the parsley leaves. 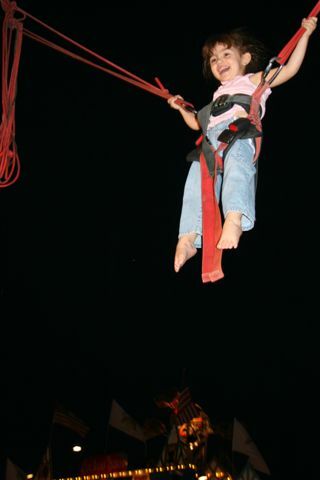 Its newly cast off skin was just underneath it. 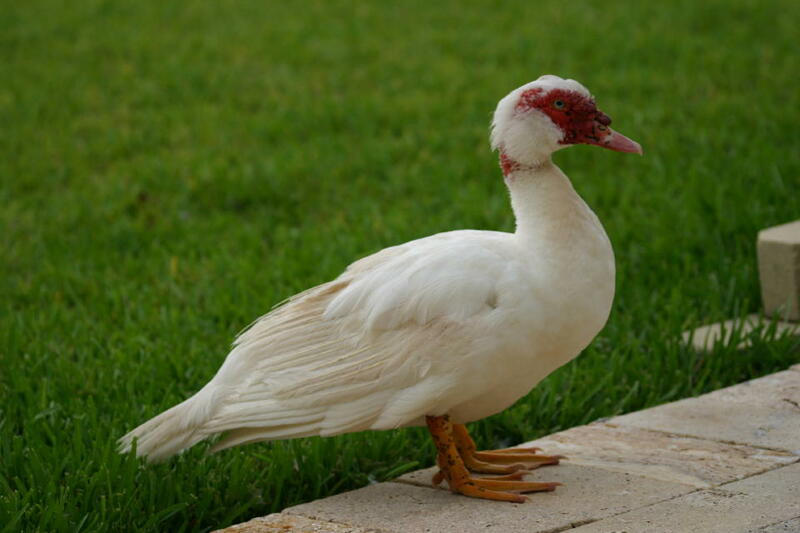 The protuberance under its head seemed to grow a bit by the next day, but its color and appearance were otherwise unchanged. 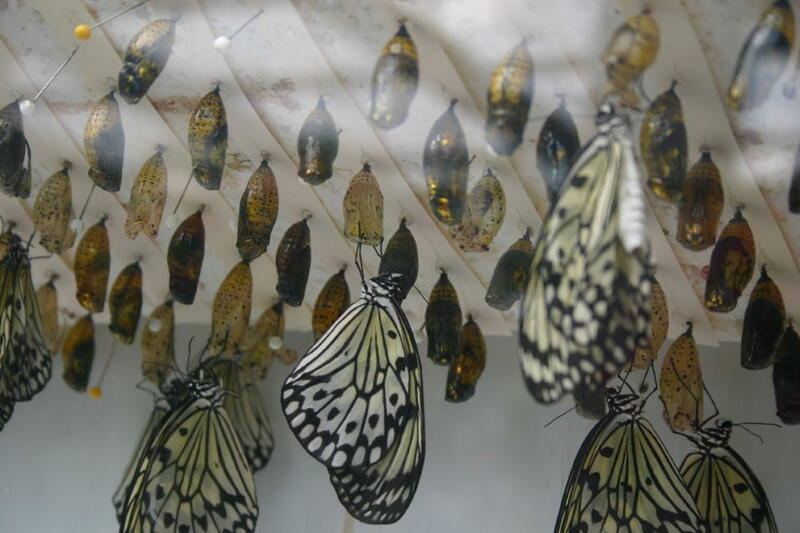 At about the one week point, the dark body of the butterfly inside the chrysalis became more apparent.On the ninth day, the wing spots were visible and we knew the butterfly was ready to emerge. We watched the British Open on TV, but did check a couple of times. 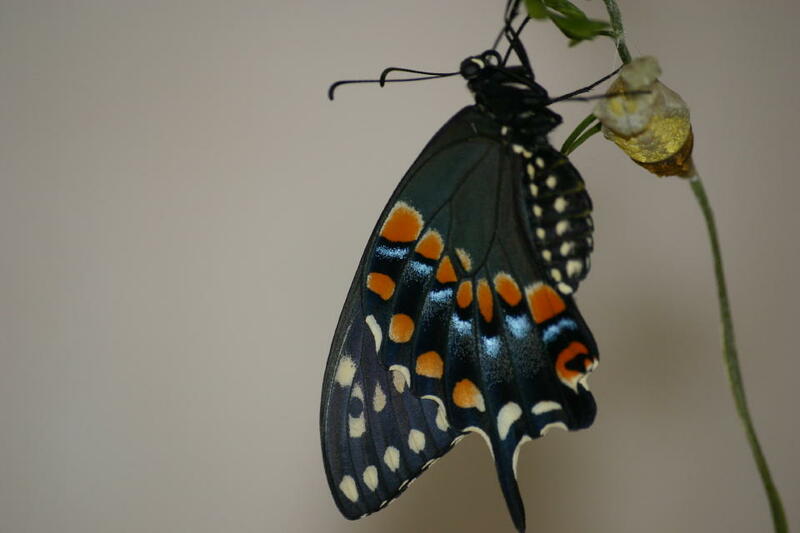 The Black Swallowtail had emerged. We brought it outside and I took a final photo. 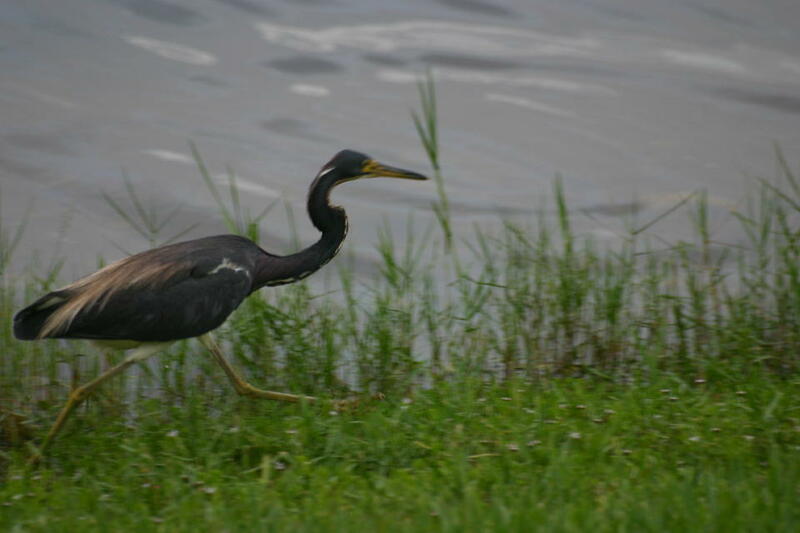 It flew away a few minutes later. The row of yellow spots on the margin of the forewing and the blue band on the hindwing identify this as a female. 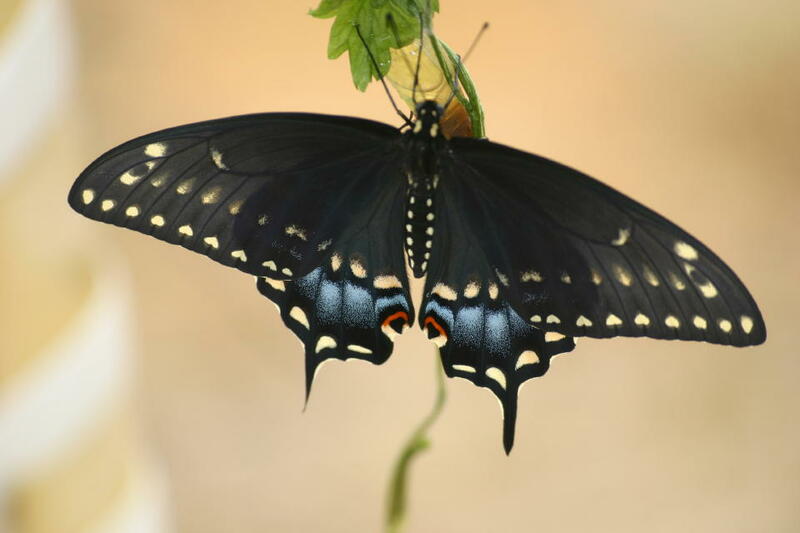 To find out more about the life history of this butterfly, see Black Swallowtail species description in the Texas A&M Field Guide, and this excellent guide from Montana State University. 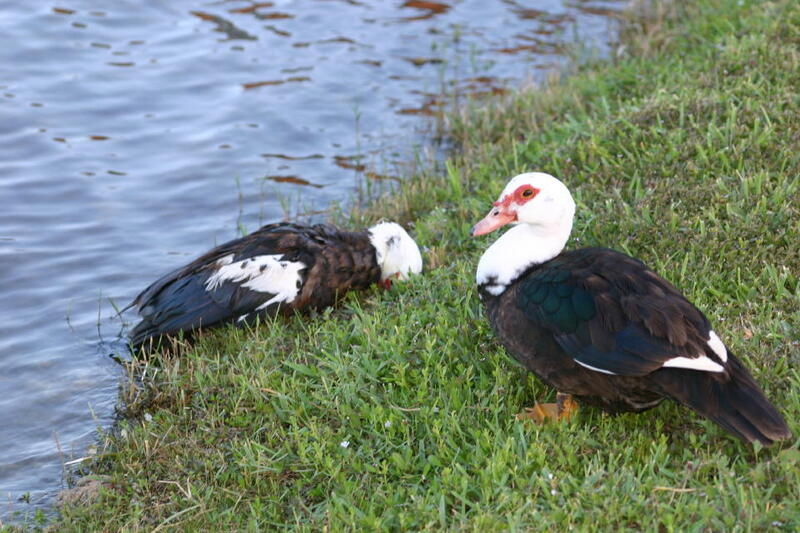 We commented earlier on the lack of Muscovy ducklings on our lake this spring as compared to the three past years we have lived in Florida. 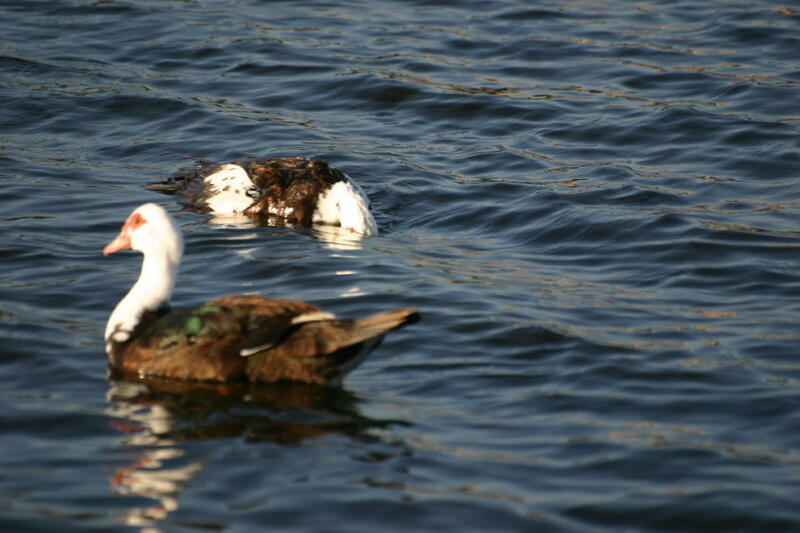 Whatever the cause, it appeared to be a local aberration, as the ducks seemed to be reproducing normally on other lakes in our area. 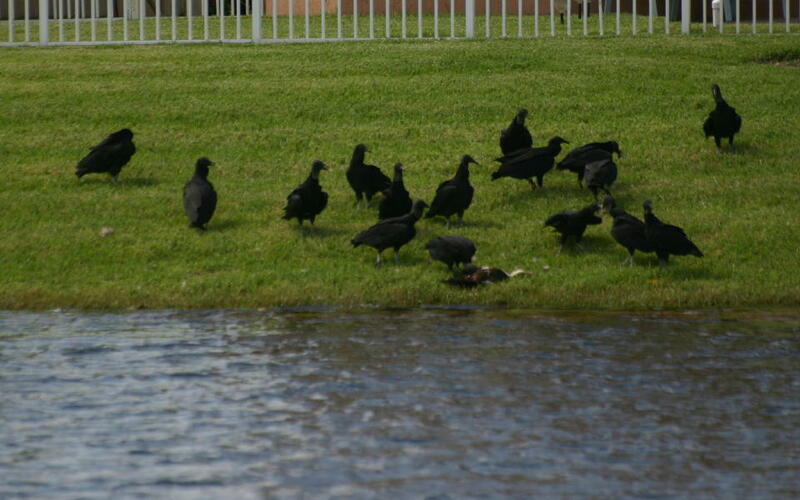 The local delay in nesting success may have been related to the social disruption that attended the death of El Presidente, the mean old drake who had ruled over our lakeside back yard for at least two years. 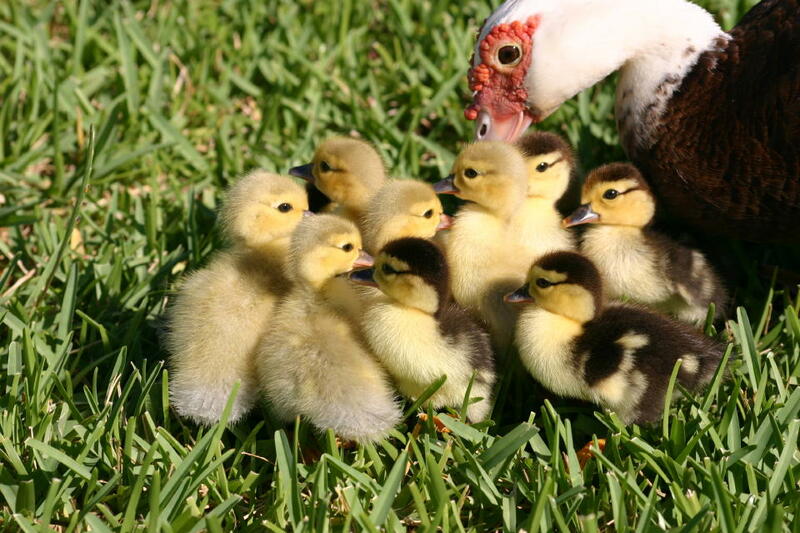 Yesterday, the hen that had been incubating a dozen eggs under our cocoplum emerged to show off her new brood. The rains have already brought our lake levels up to normal and sunfish are tending their circular nests along the shore. 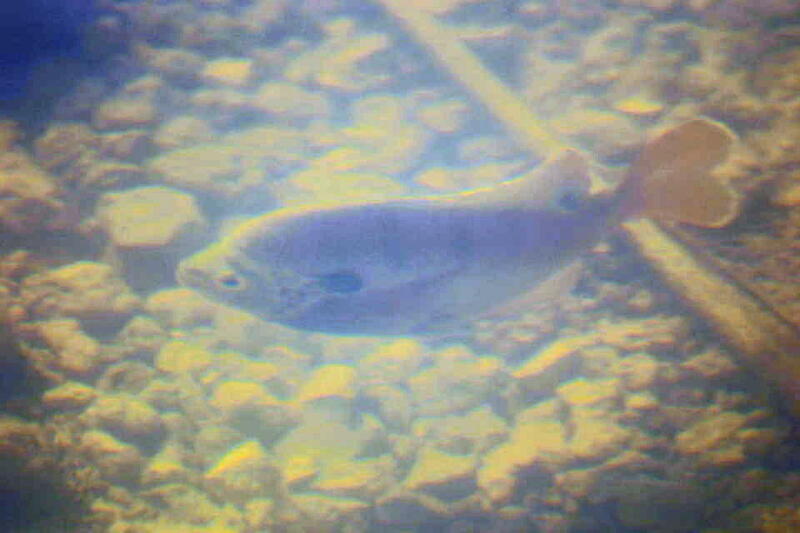 This one’s dark gill extensions and the black spot at the base of its dorsal fin tentatively identify it as a Bluegill. The water is unusually clear, and large schools of 2 to 3 inch fish with 7-8 vertical body stripes are swimming all along the shore. 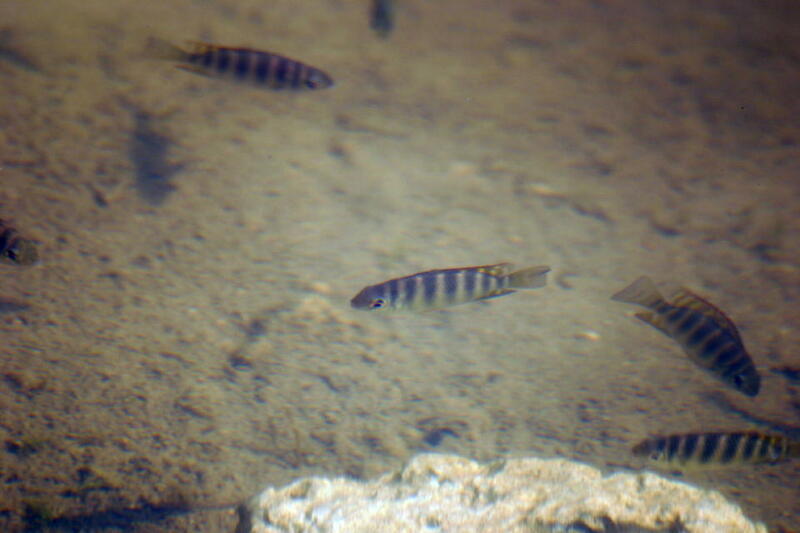 Not sure of the species, but they may be young exotic Spotted Tilapia– I welcome others to help me identify them. 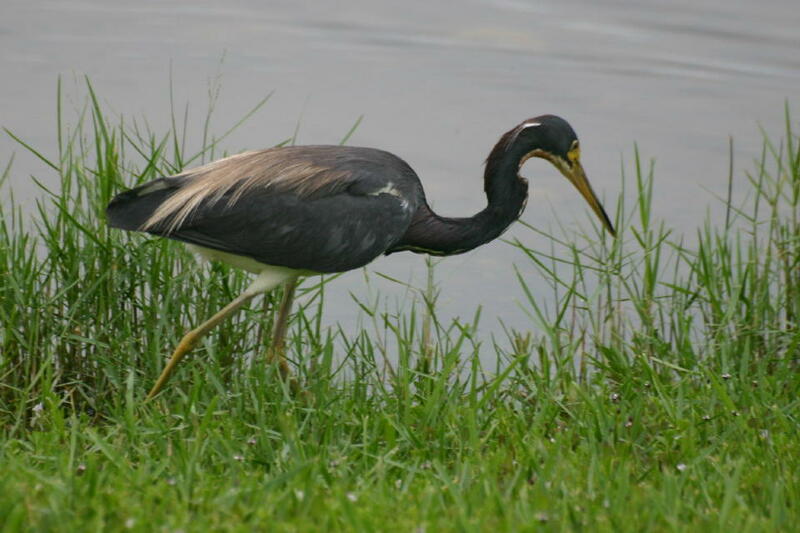 Whatever their species, these fish are now attracting good numbers of herons. 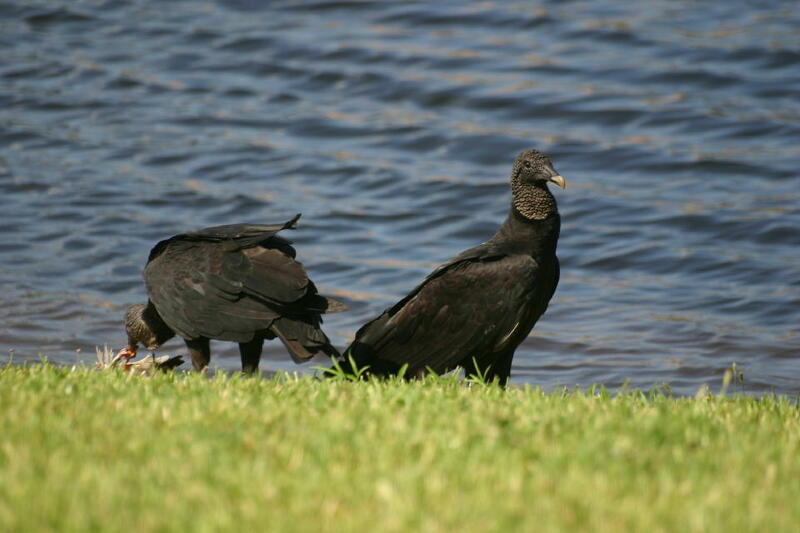 forth, seemingly unable to settle on any one feeding place at the water’s edge. 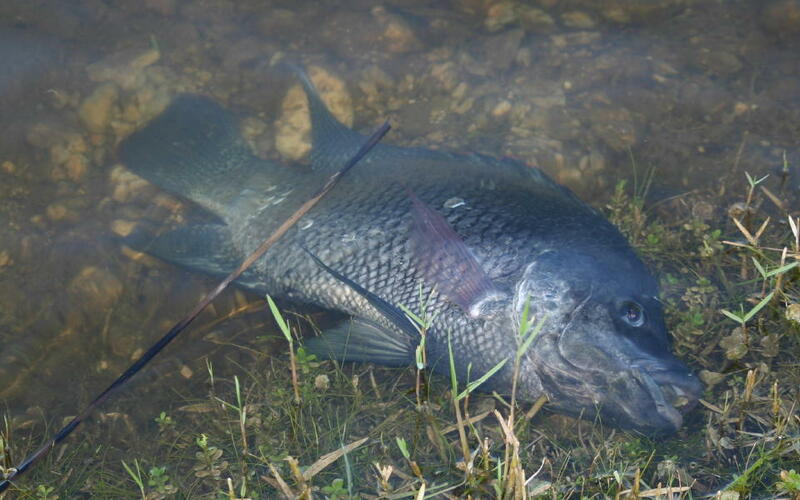 Here, it responds to the disturbance created by a large Grass Carp foraging along the shore. 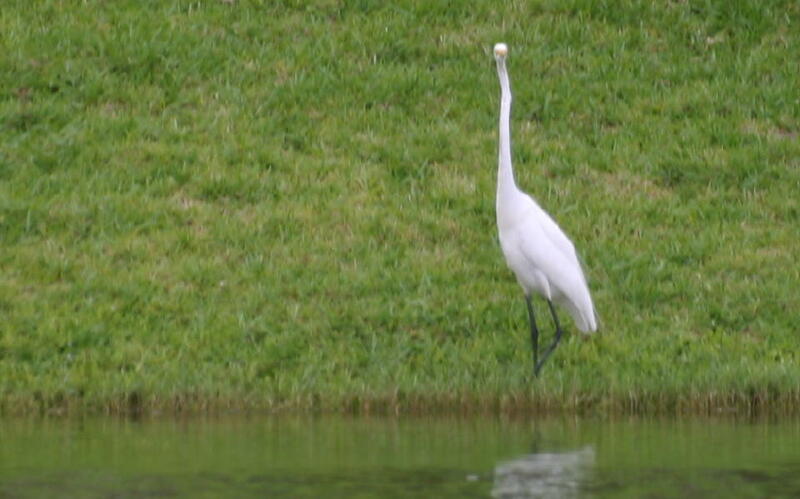 A wary Great Egret denied me any closeups, so I settled for this view of him at about 100 yards. 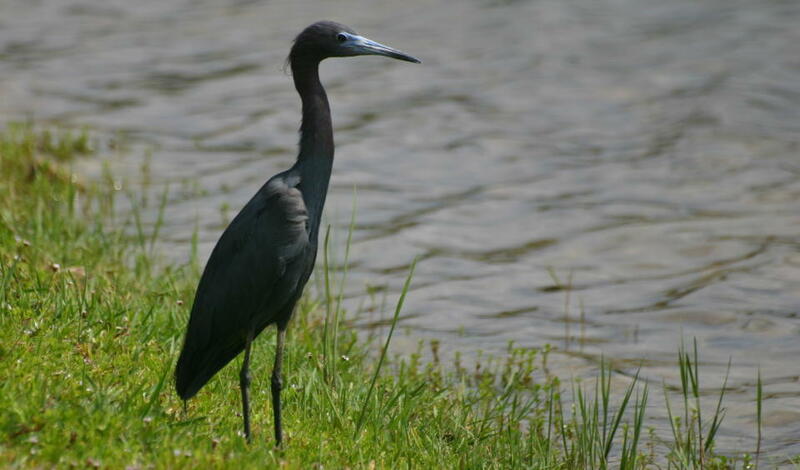 This Little Blue Heron was more cooperative. This afternoon, I noticed that more than half my parsley plant seemed to have been cropped off quite neatly. 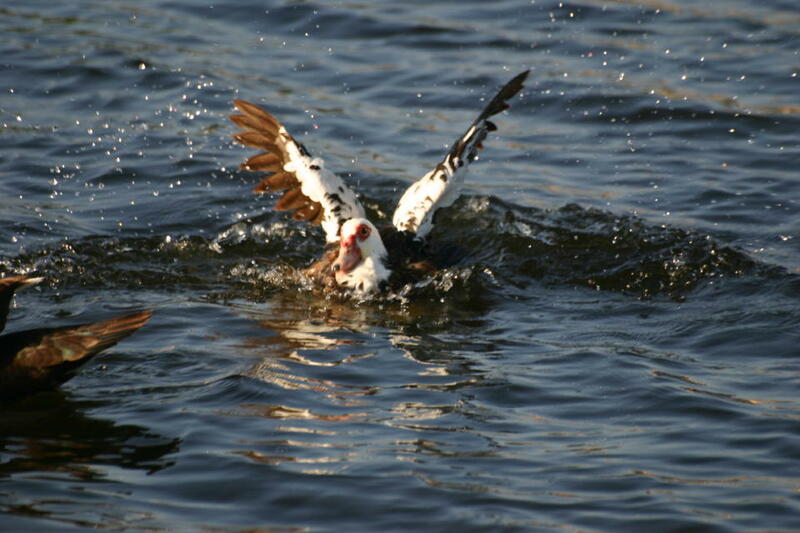 I immediately suspected Old Whitey, the Muscovy Alpha drake who defeated Whitewing to expand his territory into part of our back yard. He looked guilty, as he had been hanging around the herb garden all day. On closer inspection, several brightly colored caterpillars were evident. 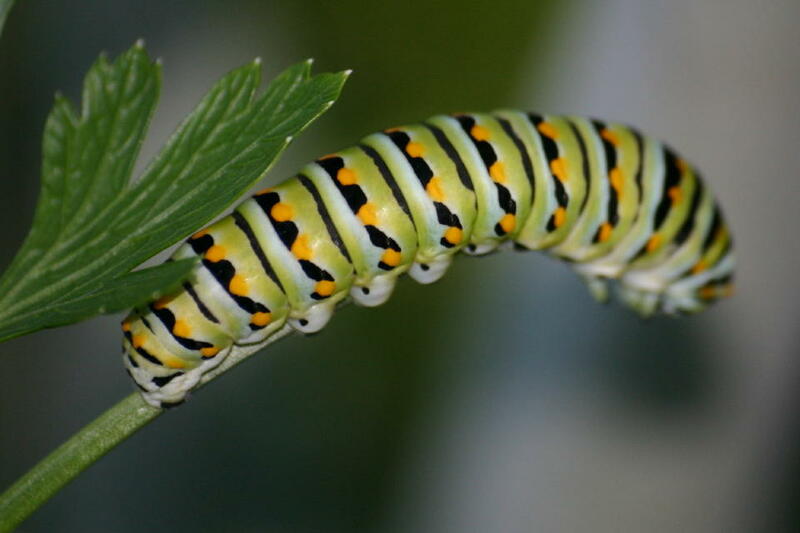 They appeared to be the larvae of the Black Swallowtail. 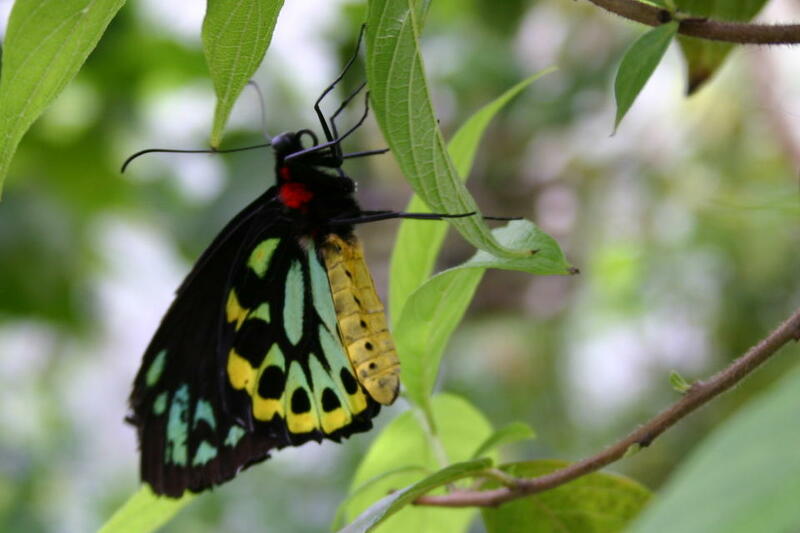 This butterfly species has a particular affinity for parsley. 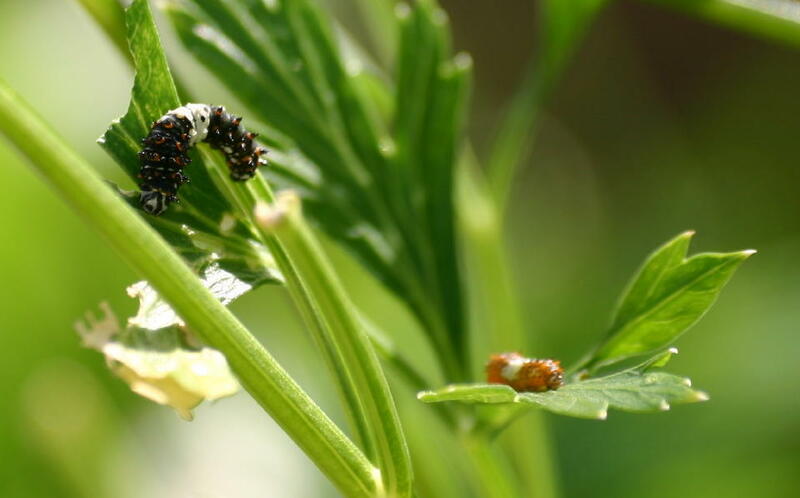 In truth, only a few days ago I saw that the parsley was growing too tall and planned to prune it rather severely, so the caterpillars had spared me the trouble. I will leave them undisturbed and watch their progress. 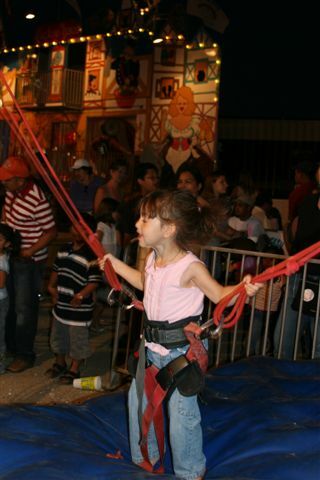 They reminded me of a recent visit to Butterfly World in Coral Springs with house guests from New Mexico. 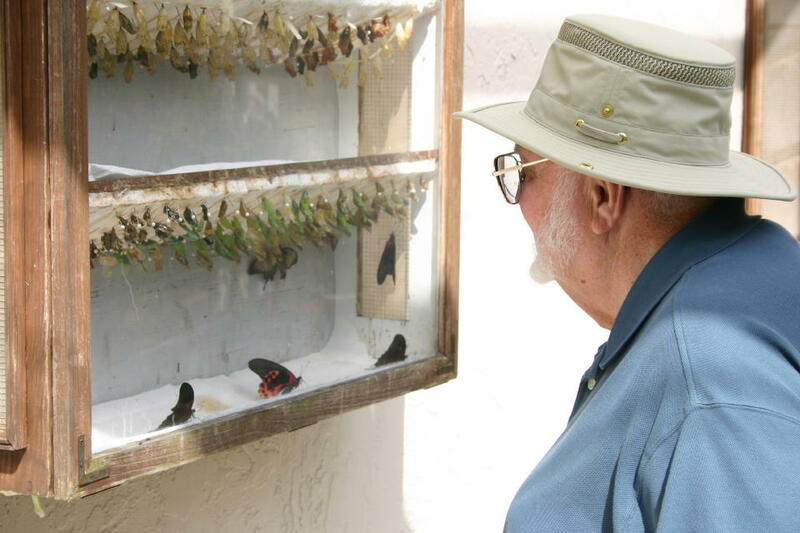 Here, our friend and former neighbor George examines an exhibit of butterflies emerging from their chrysalises. It is a shame that, despite my love of nature and my appreciation of the beauty of butterflies, I never tried to learn their names. Presumably, these are exotic species. This one, unnamed species, was a standout.